The exact chemical composition within NdFeB depends on the grade of NdFeB. Dysprosium and Praseodymium are added as a replacement for some of the Neodymium to improve the corrosion resistance and to improve the Hci (Intrinsic coercivity) of the “Neo”. An example of the composition is given below. The Neodymium metal element is initially separated from refined Rare Earth oxides in an electrolytic furnace. The “Rare Earth” elements are lanthanoids (also called lanthanides) and the term arises from the uncommon oxide minerals used to isolate the elements. Although the term “Rare Earth” is used, it does not mean that the chemical elements are scarce. The Rare Earth elements are abundant e.g. Neodymium element is more common than gold. The Neodymium, Iron and Boron are measured out and put in a vacuum induction furnace to form an alloy. Other elements are also added, as required for specific grades e.g. Cobalt, Copper, Gadolinium and Dysprosium (e.g. to assist with corrosion resistance). The mixture is melted due to the high frequency heating and melting the mixture. In simplified terms, the “Neo” alloy is like a cake mixture with each factory having its own recipe for each grade. The resultant melted alloy is then cooled to form ingots of alloy. The alloy ingots are then broken down by hydrogen decrepitation (HD) or hydrogenation disproportionation desorption and recombination (HDDR) and jet milled down in a nitrogen and argon atmosphere to a micron sized powder (about 3 microns or less in size). This Neodymium powder is then fed into a hopper to allow the pressing of magnets to occur. There are three main methods of pressing the powder – axial and transverse pressing. Die pressing requires tooling to make a cavity that is slightly larger than the required shape (because sintering causes shrinkage of the magnet). The Neodymium powder enters the die cavity from the hopper and is then compacted in the presence of an externally applied magnetic field. The external field is either applied parallel to the compacting force (this axial pressing is not so common) or perpendicular to the direction of compaction (this is called transverse pressing). Transverse pressing gives higher magnetic properties for the NdFeB. A third method of pressing is isostatic pressing. The NdFeB powder is put into a rubber mould and is put into a large fluid filled container which then has the pressure of the fluid increased. Again an external magnetizing field is present but the NdFeB powder is compacted from all sides. Isostatic pressing gives the best possible magnetic performance for Neodymium Iron Boron. The methods employed vary depending on the grade of “Neo” required and are decided by the manufacturer. The external magnetizing field is created by a solenoid coil set either side of the compacting powder. The magnetic domains of the NdFeB powder align with the magnetising field that is applied – the more homogenous the applied field, the more homogenous the magnetic performance of the Neodymium magnet. As the Neodymium powder is pressed by the die, the direction of magnetisation is locked in place – the Neodymium magnet has been given a preferred direction of magnetisation and is called anisotropic (if no external field were applied it would be possible to magnetise the magnet in any direction, which is called isotropic, but the magnetic performance would be much lower than that of an anisotropic magnet and is usually confined to bonded magnets). Rare Earth magnets exhibit uniaxial magnetocrystalline anisotropy i.e. they have a unique axis crystal structure corresponding with the easy axis of magnetisation. In the case of Nd2Fe14B, the easy axis of magnetisation is the c-axis of the complex tetragonal structure. In the presence of an external magnetizing field, it aligns along the c-axis, becoming capable of being fully magnetised to saturation with a very high coercivity. Before the pressed NdFeB magnet is released it is given a demagnetising pulse to leave it unmagnetised. The compacted magnet is termed a ‘green’ magnet – it is easy to force to crumble apart and its magnetic performance is not good. The ‘green’ Neodymium magnet is then sintered to give it its final magnetic properties. The sintering process is carefully monitored (a strict temperature and time profile has to be applied) and occurs in an inert (oxygen free) atmosphere (e.g. argon). If oxygen is present, the resultant oxides destroy the magnetic performance of the NdFeB. The sintering process also causes shrinkage of the magnet as the powder fuses together. The shrinkage gives a magnet close to the required shape but the shrinkage is usually uneven (e.g. a ring may shrink to become an oval). At the end of the sintering process a final rapid quench is applied to rapidly cool the magnet. This is to minimize the unwanted production of ‘phases’ (in simplified terms, variants of the alloy with poor magnetic properties) that occurs at temperatures below the sintering temperature. A rapid quench maximizes the magnetic performance of NdFeB. Because the sintering process causes an uneven shrinkage, the shape of the Neodymium magnet will not be to the required dimensions. The next stage is to machine the magnets to the required tolerances. Because machining is required, the Neodymium magnets are made slightly larger when being pressed e.g. larger outer diameter, smaller inner diameter and taller for a ring magnet. 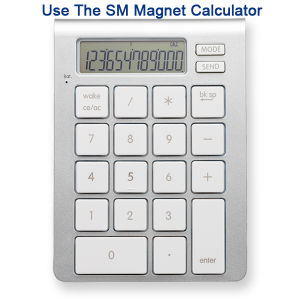 Standard magnet dimensional tolerances are +/-0.1mm although +/-0.05mm is achievable at extra cost. The possibility of even tighter tolerances depends on the shape and size of the magnet and may not be achievable. For note, the Neodymium magnet is very hard. Trying to cut holes in NdFeB with a standard drill or carbide tip will blunt the drill bit. Diamond cutting tools (CNC diamond grinding wheels, diamond drills, etc) and wire cutting machines (EDM) have to be used. The NdFeB swarf powder produced during machining needs to be cooled by liquid otherwise it may spontaneously combust. For Neodymium block magnets, there may be cost savings in using much larger magnet blocks made by isostatic pressing and cutting them into smaller Neodymium blocks of the desired size. This is done for speed and for mass production (where enough cutting and grinding machines are present) and is known as “slice and dice”. Once the final dimensions for the magnet has been met by machining, the Neodymium magnet is given a protective coating. This is usually a Ni-Cu-Ni coating. The magnet must be cleaned to remove any swarf/powder from machining. It is then dried thoroughly before being plated. It is imperative that the drying is thorough otherwise water is locked into the plated Neodymium magnet and the magnet will corrode from the inside out. The plating is very thin e.g. 15-35 microns for Ni-Cu-Ni (1 micron is 1/1000mm). The current range of coatings available are as follows:- Nickel-Copper-Nickel (Ni-Cu-Ni) [standard], Epoxy, Zinc (Zn), Gold (Au), Silver (Ag), Tin (Sn), Titanium (Ti), Titanium Nitride (TiN), Parylene C, Everlube, Chrome, PTFE (“Teflon”; white, black, grey, silvery) , Ni-Cu-Ni plus Epoxy, Ni-Cu-Ni plus Rubber, Zn plus Rubber, Ni-Cu-Ni plus Parylene C, Ni-Cu-Ni plus PTFE, Tin (Sn) plus Parylene C, Zinc Chromate, Phosphate Passivation and Uncoated (i.e. bare – not recommended but is sometimes required by the customer). Other coatings may be possible. It is not recommended to use the magnet without a protective layer.